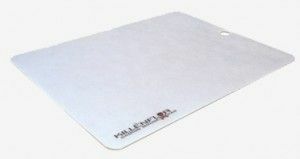 The Killenflor™ is a large tri-laminate semi-rigid mouse pad specifically designed to provide an ideal tough, low-friction glide surface for steel glide bearings as well as conventional teflon mouse glides. Its optically bright surface ensures maximum tracking bandwidth and optimal sensor reads for perfection in optical tracking for the RTR-720 and all other optical mice. Use of modern, lightweight materials keeps both the weight and cost of this high performance pad low.